Father’s Day is an important occasion celebrated not only across the UK but in over one hundred other countries worldwide which is where Edinburgh flowers step in with our gorgeous selection of Father’s Day flowers. When it comes to your orders, distance is not a problem for Edinburgh flowers as the shop is part of the Interflora delivery network. Established in the 1920s, Interflora affiliates 58000 flower shops worldwide, making it efficient and easy for flower shops around the globe to deliver your orders regardless of the country you are in yourself. This means that Edinburgh flowers can deliver not only locally but nationwide all over the UK as well as 140 different countries internationally. This means that even if you aren’t able to be with your father on this special day, you are still able to have a gorgeous bouquet or arrangement of flowers sent to him. Not only are flowers delivered, but you are able to have a gift from the gifts range on offer at Edinburgh flowers delivered alongside your flowers. This gifts range includes a selection of delectable wines - including rose, red or white - and champagnes all rich in taste. These beverages are widely considered to be celebratory drinks and Father’s Day is definitely an occasion worth celebrating. Also in this gifts range are deliciously scrumptious chocolates which simply melt in your mouth, ideal for a dad with a sweet tooth; fruit baskets in varying sizes, all full to the brim with juicy and fresh fruits; gorgeous candles as well as balloons. If requested, the Edinburgh florists are able to arrange charming balloon bouquets which usually consist of three blank balloons and three with a message fitting for your occasion. Edinburgh flowers want to go above and beyond the traditional services of a florist by providing our customers with as many different services possible so your order from us is as stress free as possible. It can sometimes be difficult choosing flowers for a close loved one, especially your dad as flowers are usually given to mums on Mother's Day, but Edinburgh flowers are here to help and provide you with the best possible floral designs. The flowers the Edinburgh florists work with have been imported all the way from the fields of Holland as this western region of the Netherlands is renowned for cultivating some of the best, premium quality flowers in the world. Good quality means that the flowers will have a high longevity so your dad will be able to enjoy the beauty of your bouquet or flower arrangement for many days yet to come. Up on the Edinburgh flowers website, you can have a browse through the Father’s Day collection to see if anything tickles your fancy. Don’t worry if nothing quite catches your eye as Edinburgh flowers offer all customers the choice to use the bespoke service. This service enables you to work in collaboration with the Edinburgh florists in order to design the perfect arrangement for your dad. 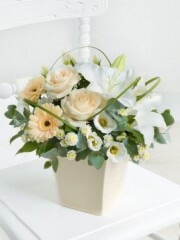 You can specify what flowers you would like used, what flowers to avoid, colour preferences and so on. 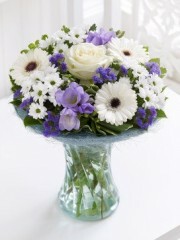 Once all the details have been acquired by the Edinburgh florists, they will turn your ideas into reality. If you are unsure as to what your dad would like, the Edinburgh florists are able to help as they can give suggestions and ideas which have proven to be popular for Father’s Day. If you have any further queries about the services we provide, please do not hesitate to get in touch as there is always a member of the Edinburgh flowers team ready to answer all of your questions.